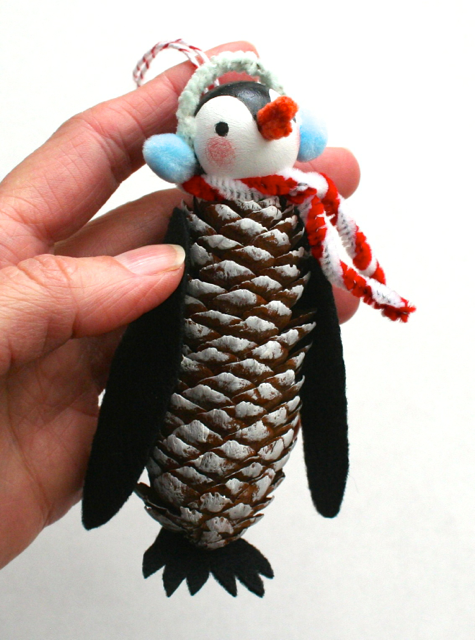 When I saw the MS pinecone penguins I was charmed and then determined to make my own version. 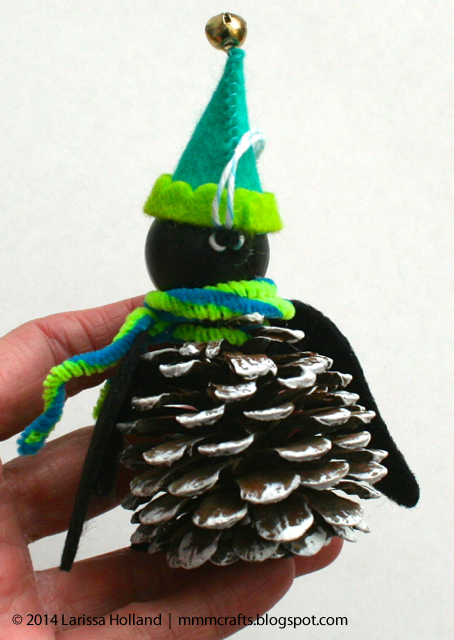 I didn't follow their tutorial because I wanted to use painted wooden beads for the heads and stiffened black felt for the wings and feet instead of acorn caps and pinecone petals. So I made it up as I went along. The tall ornament is for big brother Gage and shorty is for little brother Asher. I used the bead hole on the front of the faces to insert cotton pipe cleaner beaks. I painted store bought pinecones with white acrylic paint on the tips only and then hot glued the finished heads, wings and feet. The fun part was adding the tiny ear muffs, scarves and hat. They look cute from behind too. Especially shorty. The hole on the back of the head was a convenient place to add the hanging loop after I inserted a twisted black pipe cleaner. Oh, wow! They are super adorable! Every little detail! Hee... soooo cute!! She might! It'd be a fun craft to do together! 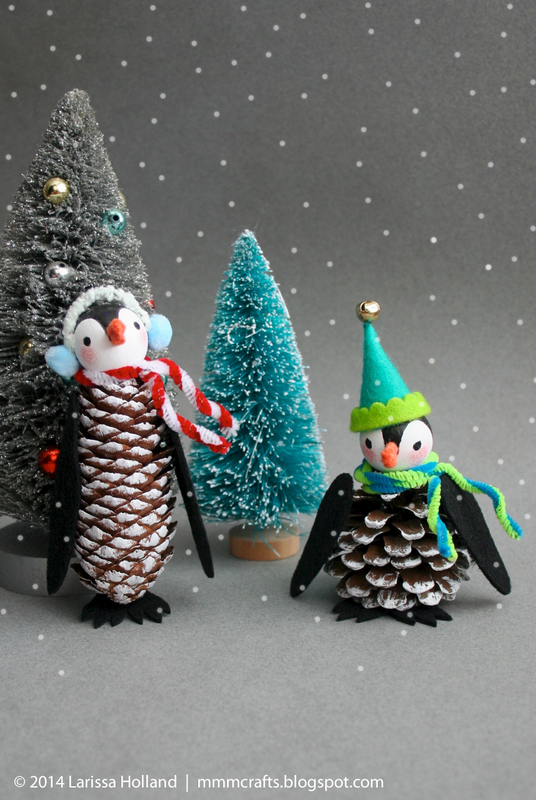 Larissa I love your version of the penguins from Martha Stewart magazine. .So sweet. thanks for sharing. 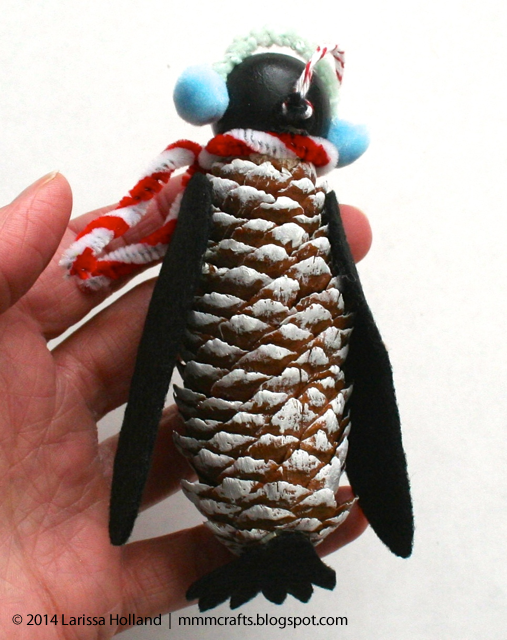 Your work always inspires me. .
Well, it says quite a lot about your crafting mojo if you can still charm an 11 year old boy with a handmade penguin ornament in the middle of all his other gifts. Well played. (Ash likes his, too.) Soooo cute! Can't wait to add all of our new goodies to our tree next year. Thank yoooooouuuuu! 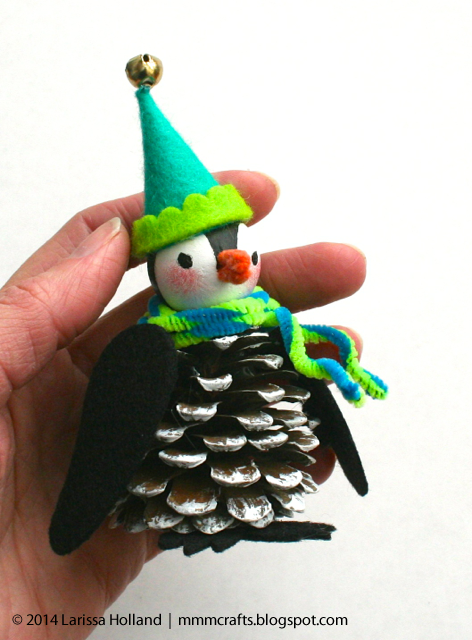 Hi, Sanne, I wasn't worried about them standing up per se since they are Christmas ornaments and hang on the tree, but the pinecones I chose had flat-ish bottoms. The short one stands on its own but the tall one has to lean against something. If you would like yours to stand, I'd level up the bottom before starting by cutting it with a saw or removing some prongs.